SACRAMENTO, California -- At least seven people were stabbed, two with life-threatening injuries, at a political rally in Sacramento. The Capitol is now on lockdown. 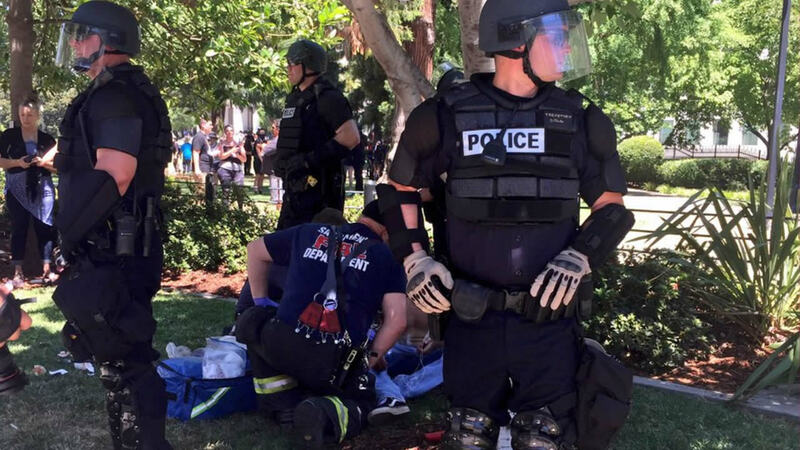 Sacramento Fire Department spokesman Chris Harvey says a rally by KKK and other right-wing extremists groups turned violent Sunday when they were met by counter protesters. Officer Matt McPhail with the Sacramento Police Department says none of the injuries are believed to be life-threatening. He says a large fight broke out after people carrying sticks rushed into the area where the rally was being held. Harvey says California Highway Patrol officers managed to break up the large fight but that some members of both groups remain in the area. A reporter from the ABC News affiliate in Sacramento described the scene saying there is blood on the sidewalk of the park where the violence occurred and that police have taped off the area. The rally was organized by group affiliated with the Traditionalist Workers Party, with links to white supremacists, who had permits to hold their rally. The victims were all present while a protest took place, though McPhail said it was still unclear whether and how they were involved. The Traditionalist Workers Party had scheduled and received a permit to protest at noon Sunday in front of the Capitol. McPhail says a group of counter-protesters showed up to demonstrate against them. Stay with ABC7 News for updates to this developing story.